Ciao from Rome! We’re currently slowly waking up from our daily nap and figuring out what we want for dinner. Pasta? Pizza? More Pasta? 20489384 scoops of pistachio gelato? I think we might get pizza… It’s only been 2.5 days in Italy and we’ve already developed our daily rhythm of waking up super early, grabbing an espresso and some form of carb for breakfast, walking a million miles, poking our heads into a gorgeous church, gazing at some ruins or classical art, eating an afternoon mortadella sandwich, walking another million miles, stoping for a drink and apertivo, napping at the airbnb, mustering up enough energy to find dinner, getting a scoop of gelato, and then passing out hard to repeat again the next day. My feet feel like they are going to fall off but it’s all worth it! I’ll be keeping this short and week because I feel like I need to nap just a little bit more… I was actually going to share Reuben’s Pizza recipe today but Squarespace is failing me and all the drool worthy photos of pizza are not loading! I was frowning a lot this morning and then I remember we are in Rome and I shouldn’t be frowning at all. It will just have to wait 2 more weeks until we are home to share. No worries though, because I have this noodle double feature to share instead! One post back you’ll find a recipe for the greatest and chewiest homemade Chinese egg noodles! They are so good and addicting, you’ll find it hard to ever go back to dried pasta ever again! This recipe dresses up the fresh noodles in a ton of garlic, a healthy amount of butter, and just the right amount of chili oil. It’s simply a spicy version of my San Francisco Style Garlic Noodles. One of the best things on Eat Cho Food! Despite how red and fiery these noodles look, they actually aren’t super spicy. The butter and the garlic really balance out and mellow the chili oil. I’m normally a wimp when it come spicy food, but I was able to polish off a whole plate without any assistant from a glass of milk! These noodles are perfect as is but would also be pretty spectacular with a side of your favorite seafood or protein! Boil your noodles until al dente. When cooking fresh Chinese egg noodles it should only take about 4 minutes. Rinse with cold water and set aside to drain. Heat a large skillet on low heat. Add 5 tbsp butter to the skillet and allow it to slowly melt. Once the butter has melted, add in minced garlic and cook on low heat for 4 to 5 minutes. The garlic shouldn't brown too much. You are really trying to infuse the butter with garlic flavor. Turn up the heat of the skillet to medium high. Add oyster sauce, chili oil, sugar, pinch of salt, and dash of white pepper. Add in egg noodles and toss the noodles so that everything is evenly coated and mixed. Leave the noodles alone for 3 minute and then toss. Repeat this until the noodles are lightly crisped. Garnish with parsley, sesame seeds, and some extra chili oil if you wish. Enjoy! I’m so excited to share this recipe for homemade Chinese Egg Noodles with you guys! It means that you can literally have noodles at anytime! As long as you have flour, water, and eggs you’re all set. I call these Chinese Egg Noodles, but to be honest with you I’m not entirely sure what makes these noods any different than all the other egg noodles we have been eating in Italy. I’m going to keep the name, because I got my 23andMe results back and I’m 70% Chinese and 00000000% Italian. Pasta is pasta. Carbs are carbs. So no matter what you call them they are going to taste good! When you think of Italian and Chinese foods there are definitely a few crossover episodes. Noodles obviously. Ravioli and dumplings. Tortellini en Brodo and Wonton Soup! Calabrian Chilis and Chili Oil! We unfortunately didn’t plan for any pasta making classes while in Italy. Actually, who knows? Kristina of the past wrote this, so maybe there was a surprise class! I’ll just have to keep practicing when I get home. Making noodles might be my new favorite thing to do in the kitchen. It’s pretty neck and neck with making dumplings at this point. My family never made homemade noodles growing up. We were more of a homemade dumpling wrapper household. But the noodles that were pivotal in my family’s favorite noodle dishes were always pre-made or of the instant variety. Don’t get me wrong, I’m going to be buying instant ramen and pre-made noods for the rest of my life, but I’m also go to whip up these thick, chewy, and eggy noodles whenever a craving strikes and I no longer live within 1 minute of our favorite Asian grocery story. Homemade noodles just taste a bit more luscious? Not sure if that is the right word, but I think because you spent the extra time to craft them by hand it adds an extra something something. You can make these noodles completely by hand if you wish! You’ll just need a fairly large rolling pin and work surface to roll out the pasta thin. I just felt like busting out my pasta roller because its fun! I also really enjoy the cutting the noodles by hand. It has a similar meditative quality to folding dumplings. I could do it forever! Or at least until I get hungry. These egg noodles are perfect for any stir fry recipes! Soups too! I would cut these a little thinner for soup though. In a few days I’ll be sharing a recipe for Chili Garlic Noodles that utilize these dreamy noods. It’s going to be so good! Pile flour on a clean work surface. Make a well in the center of the flour pile. Add eggs and water into the well. Using a fork start whisking the eggs and water together. Gradually start mixing in the flour until you get a shaggy dough. Start kneading the dough until smooth. Knead for 10 minutes and use a bench scraper to help scoop up the dry flour bits. After 10 minutes of kneading and the pasta is smooth, cover the dough with plastic wrap and allow to rest for at least 30 minutes until ready to work with. After the dough has rested, divide the dough in half. Keep one half wrapped in plastic wrap to avoid drying out. If rolling out with a pasta machine: Roll out one half of the dough until its about 3/4” thick and oval shaped. Feed the dough through the pasta machine on the thickest setting first. Continue to feed the do through until the dough is about 1/8” thick. Layout thin dough on your work surface. Lighting dust the dough with cornstarch. Fold the dough in half lengthwise. Dust with a bit more cornstarch and half in half one more time. Using a sharp knife, cut into 1/8” wide noodles. You can also use a pasta attachment if you wish. Loosen the noodles with your hands so they don’t stick together. Cover with plastic wrap until ready for cooking! Fresh egg noodles will cook in about 4 minutes when boiled. Long time no see! Two weekends ago I spent the whole time working on a bunch of recipes for you guys and each one of them failed miserably. MIS.ER.AB.LY. So since then I’ve taken a little break from the kitchen, more specifically from baking. Every once in a while I need to step away from the blog and just make delicious food that doesn’t need to be photo ready or meticulously styled. This little break came at the perfect time too, because a bunch of Reuben’s college friends have been in town for the last week for a wedding! I felt present and totally ready to talk to strangers, eat a lot of good food, and drink moderately… sort of. For 5 nights straight we stayed out to at least 10 pm (omg) and I had at least one alcoholic drink (omggg). My inner 80 year old felt like she was going to keel over. But I survived! For a few hours on Sunday I wasn’t so sure about that. Let's talk noods. Today I'm sharing with you one of my favorite and easiest noodle recipes! My dad would make this dish for my brother and I growing up as an after school or mid-day snack. At the time it seemed like it only took my dad 10 seconds to whip this dish up. It's a real quick recipe! If you haven't had cheung fun before and are a huge fan of chewy textured food, you're in for the a treat! Cheung fun are steamed rice noodles rolled up into thick and chewy noodle rolls. Sometimes they are filled with shrimp, pork, or veggies. As the plain food eating child of the 90s, I always opted for the plain cheung fun. No fillings. Just noodle. Light on the soy sauce. You can dress up cheung fun in so many different ways, but I'm sharing a pretty simple preparation that you would see as a street snack in Hong Kong. The noodle rolls are chopped up into bite sized pieces, crisped up in a pan, and then tossed in a sweet and salty brown sauce! Grab a toothpick and you got yourself a classic on the go snack! Why are american street snacks this good? Does a sweet and salty brown sauce sound mysterious to you? It's actually pretty simple and you can use a variation of this sauce in a whole slew of noodle dishes or stir-frys. My sweet and salty brown sauce is a mix of oyster sauce, hoisin, sriracha, sugar, salt and pepper. That's it! You have to use Lee Kum Kee oyster sauce and hoisin though. Especially the oyster sauce. My Mom has been using Lee Kum Kee premium oyster sauce throughout my whole life. She literally puts it in everything! 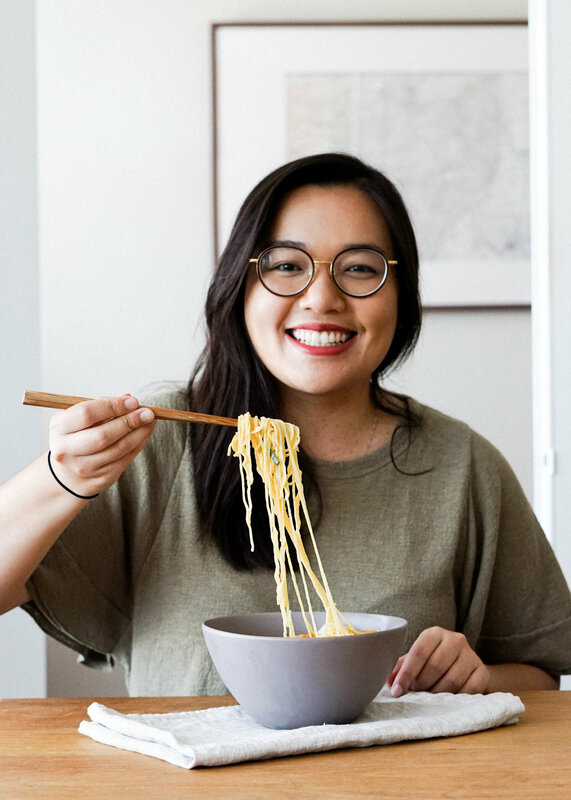 She grew up seeing their ads all over Hong Kong, so she may or may not have fan-girled a little when I told her I was going to be working on a few recipes for them! Next time you stop in your local Asian grocery store make sure to pick up a bottle of Lee Kum Kee's Premium Oyster Sauce and some cheung fun to whip yourself up this plate of deliciousness! Thank you Lee Kum Kee for sponsoring this post! If your rice noodle rolls have been refrigerated, microwave them for 90 seconds with a wet paper towel until they are soft and pliable. If the noodle rolls are still at room temperature, you’re ready to go! Cut noodles into 1” pieces. Heat about 1 tbsp of olive oil in a skillet over medium high heat. Place the noodle rolls in the hot skillet and sear on one side for 3 minutes until crisp. Flip the noodle rolls over and sear for another 3 minutes. Repeat in batches if necessary. Set noodle rolls aside. In a large bowl combine oyster sauce, hoisin sauce, Sriracha, sugar, and pepper, Give it a good mix. Add in seared noodle rolls and toss until evenly coated. Top with green onions and sesame seeds and serve! Why is it that every single time I plan on traveling for the weekend, the week leading up to it is totally bonkers? Every. Single. Time. I'm going home to Cleveland this weekend to get some family time in and to see Hamilton! I can't really explain how excited I am for this weekend. But before I get to Cleveland I need to survive this week first. Lots of deadlines and multiple moving parts to juggle over here! As much as I love staying busy, at my core I'm a creature of comfort. Which is sort of a strange duality to balance, I guess. I love to multi-task almost as much as I love laying on the couch with Reuben watching Netflix while also rolled up in my pink blanket snacking on cheese and crackers. Honestly, I probably love the latter more. If noodle soup was a more couch friendly meal that's easy to eat why you're dressed as a giant pink burrito, then I would say that noodle soup is one of the easiest and most versatile any time dishes. Actually I would still say that. Most people don't realize that noodle soups are just as easy and quick to whip us as stir-frys. Making noodle soup requires one additional pot, but you can still customize it with whatever you have in your refrigerator at the moment. Broth Base - I like to keep some beef, chicken, or vegetable stock in the cupboard for soup, but chicken bouillon also works perfectly well to enhance any soup you're stewing. Protein - Pulled chicken, Sliced beef, bits of tasty seafood, tofu, or even egg make great additions! Noodles - The most important part! I encourage you to explore the asian markets near you and see what kinds of noodles call to you. Maybe it's egg noodles, rice noodles, or something crazy like kelp noodles! The time it takes to cook a noodle soup is really as short as the time it takes to fully cook your veggies and boil your noodles. If you have some super ninja chopping skills, I bet you could have yourself a bowl of noodles in less than 30 minutes! Ah I just love noodle soups so much. It's pure comfort in a bowl. Before you tell me how it's summer time and how we should be eating crisp salads all the time, I'm going to stop you. I know it's summer time for most of you right now, but it's still foggy and chilly here in San Francisco, which means I can eat noodle soup whenever I want to! I'm utilizing the most summer ingredient in this recipe though: The Summer Tomato!! The summer tomato has taken up our Instagram feeds. Or is it just me? My favorite way to enjoy a ripe summer tomato is raw, sliced up, on toast. Simple and easy. But I want to use the summer tomato a little different. I didn't grow up with creamy Campbell's tomato soup... I honestly think it's pretty gross. My mom made really light tomato broth egg drop soup growing up and it was and still is one of the best things! You can find the recipe for it here! This noodle soup is very similar to my mom's tomato egg drop soup recipe, but I've added egg noodles and some bits of seafood to round it out as a complete meal. The broth is super light and fresh with really pure tomato flavor. It also gets a little bump of seafood flavor from the cuttlefish balls and fish tofu I added in while the tomatoes were stewing. You can find these at all Asian markets in the frozen section. Don't be turned off by the word "fish tofu" it's so freaking delicious. If those fishy things sort of scare you, you could just increase the amount of shrimp! Do what feels right! Okay, gotta back to this week's craziness! 1. Heat up olive oil over medium high heat. Add in garlic, green onions (whites), and ginger. Cook for 2-3 minutes until fragrant. Add in water, chopped tomatoes, chicken bouillon, oyster sauce, salt, and white pepper. Bring to a boil. Throw in frozen cuttlefish and fish tofu at this time. Bring it back to a gentle boil and simmer for 15-20 minutes until the tomatoes have broken down. Adjust seasoning per your taste. 2. While the soup is boiling, cook noodles per the packaged instruction. If using fresh egg noodles, they cook for only 2-3 minutes. Drain and set aside until ready to eat. 3. Turn off the heat for the soup and throw in the shrimp. The shrimp will cook in just a few minutes and will be ready once your soup is at a safe temperature to drink. 4. Add noodles to a bowl. Pour in desired amount of broth. Top with shrimp, cuttlefish balls, and fish tofu. Sprinkle with remaining green onions and enjoy!